Buy this item and earn 105 ClubPoints. 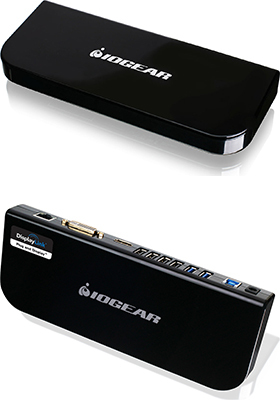 IOGEAR'S USB 3.0 Universal Docking Station quickly and easily transforms your laptop, Ultrabook or Microsoft Surface® Pro tablet into a full-featured workstation. This universal dock is an all-in-one solution to the latest port-deficient laptops and tablets. It allows you to connect as many as 10 devices to your laptop through a single high speed USB 3.0 cable that offers speeds up to ten times faster than the previous USB 2.0 standard. 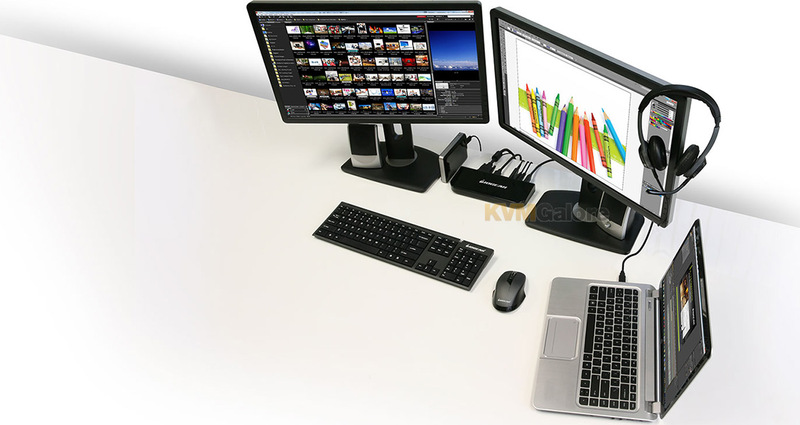 With support for dual monitors, Gigabit Ethernet, 6 USB ports, plus microphone and speaker connections, the USB 3.0 Universal Docking Station connects you to all your peripherals so that you can completely mobilize your customized home office. 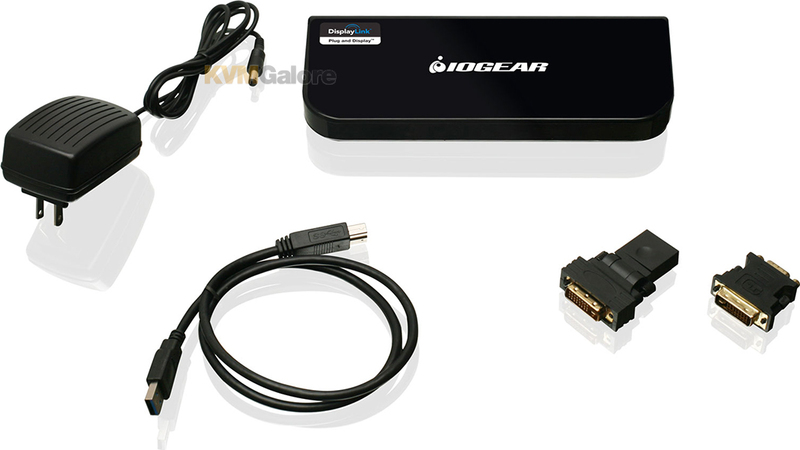 It also comes with its own power adapter so that you can connect and power all your USB devices without a worry. 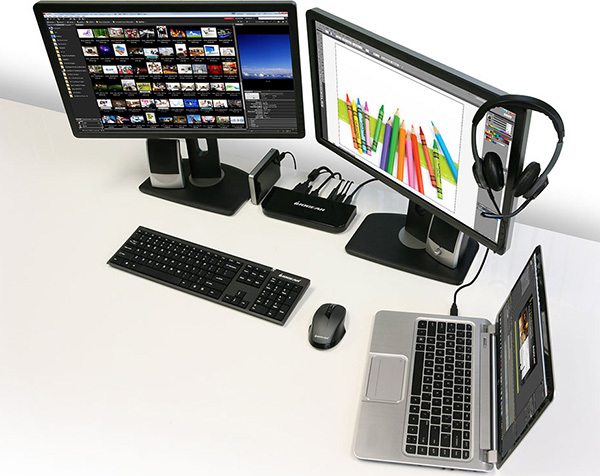 The USB 3.0 Universal Docking Station has connections to suit virtually every application. 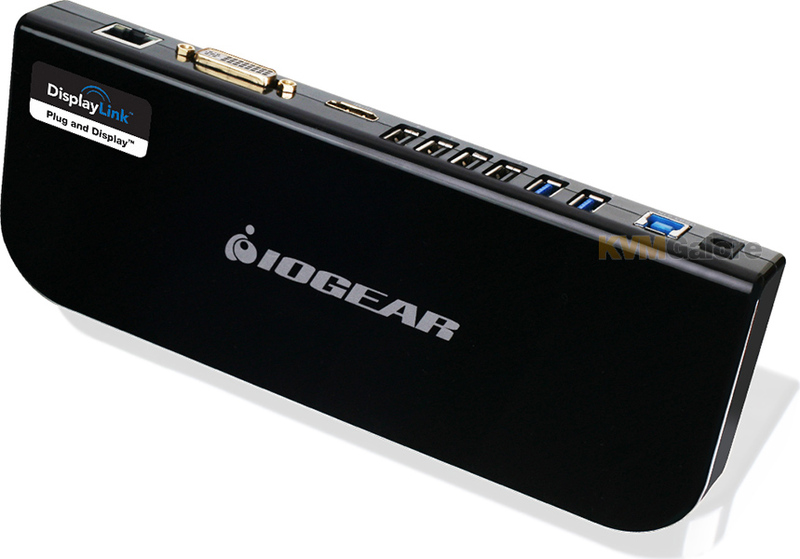 The dock gives you HDMI and DVI connections that can support a resolution of 2560x1440. It also has a gigabit Ethernet port, six USB ports (two USB 3.0 and four USB 2.0), and audio input/output jacks for headsets or speakers. Now you can easily add a full-sized keyboard and mouse, external hard drives, printers, webcams, etc. to turn your laptop into a complete workstation. Although this universal dock is equipped to take advantage of USB 3.0 Super Speed technology, it is fully backwards compatible with USB 2.0 devices. 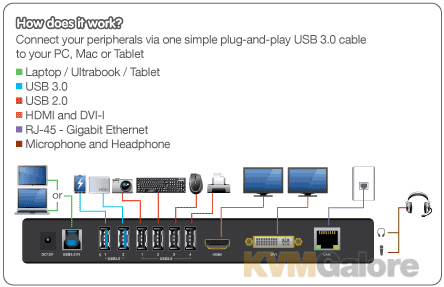 And since the connections from all your peripheral devices are consolidated to your computer through a single USB 3.0 cable, disconnecting only takes removing one plug. Ultra-portable tablets are ideal when you're on the go but their performance is restricted due to their limited connectivity. 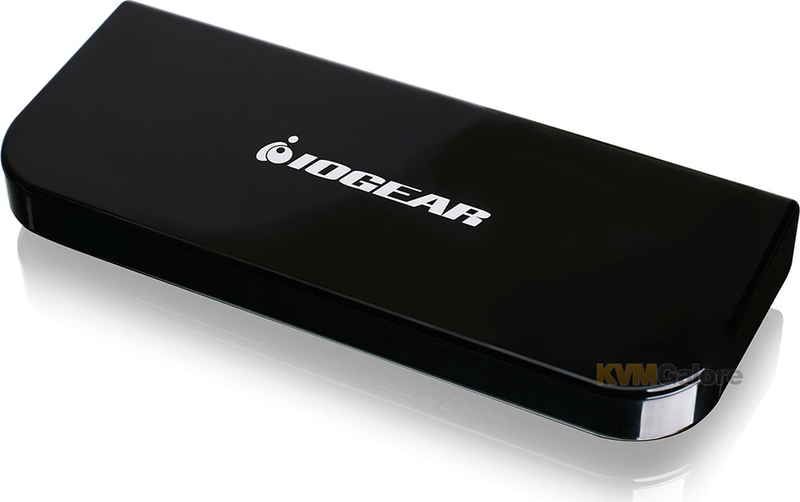 With the power of IOGEAR's USB 3.0 Docking Station and Windows, tablets are now ready to replace your home PC. When it's time to go from leisure time to work time, just plug your Windows enabled tablet into the IOGEAR USB 3.0 Docking Station and it becomes your full-blown work center! Now you have a complete home office suitable for nearly any task.